A residential and commercial neighbourhood centered around Yonge and Eglinton, with a history going back as far as the 1837 Rebellion by William Lyon Mackenzie. 111 years ago - 1908 - North Toronto at 2384 Yonge Street s.w. corner at Montgomery Ave. and Broadway Ave.
110 years ago - 1909 - North Toronto at 2384 Yonge Street s.w. 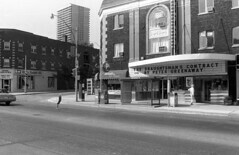 corner at Montgomery Ave. and Broadway Ave.
108 years ago - 1911 - North Toronto at 2384 Yonge Street south west corner at Montgomery Ave. and Broadway Ave.
104 years ago - 1915 - North Toronto at 2444 Yonge Street south west corner at Roselawn Ave.
98 years ago - Tuesday, November 22, 1921 - North Toronto at 2486 Yonge Street s.w. corner at Castlefield Ave.
98 years ago - Tuesday, November 22, 1921 - North Toronto at 2384 Yonge Street s.w. corner at Montgomery Ave. and Broadway Ave.
98 years ago - Tuesday, November 22, 1921 - North Toronto at 2444 Yonge Street s.w. corner at Roselawn Ave.
93 years ago - 1926 - North Toronto at 2492 Yonge Street n.w. corner at Castlefield Ave.
1931 Consumers Gas North Toronto Showroom on, Yonge St. at St. Clements Ave.
1931 People waiting for the grand opening of the Consumers Gas Showroom on Yonge St.
87 years ago - Tuesday, June 28, 1932 - North Toronto at 2398 Yonge Street n.w. corner at Montgomery Ave. and Broadway Ave.
86 years ago - Thursday, March 30, 1933 - North Toronto at 2398 Yonge Street n.w. 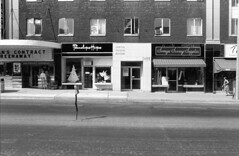 corner at Montgomery Ave. and Broadway Ave.
1952 Public library, previously Eglinton Presbyterian Church (1909-1922) on St. Clements Ave., n. side, w. of Yonge St.